"I approached Vogue to discuss the purchase of a new kitchen. Knowing I wanted something contemporary for my new extension I met with Sharan to outline my design intentions. I had concerns about the small space and potential loss of light into the room and got chatting with Sharan about this and what I hoped to achieve. Sharan proved to be highly knowledgable, demonstrating vast brand/trend awareness that was matched with care and consideration for overall functionality, taste and budget. Her intuition was notably impressive and she proved very adept at understanding the project and my preferences. After discussing ideas she was able to show me samples that very much suited my personal taste. A design was worked up and on my return to the showroom I was delighted to find that it instantaneously resonated with me. There was little left to do, bar place an order!" 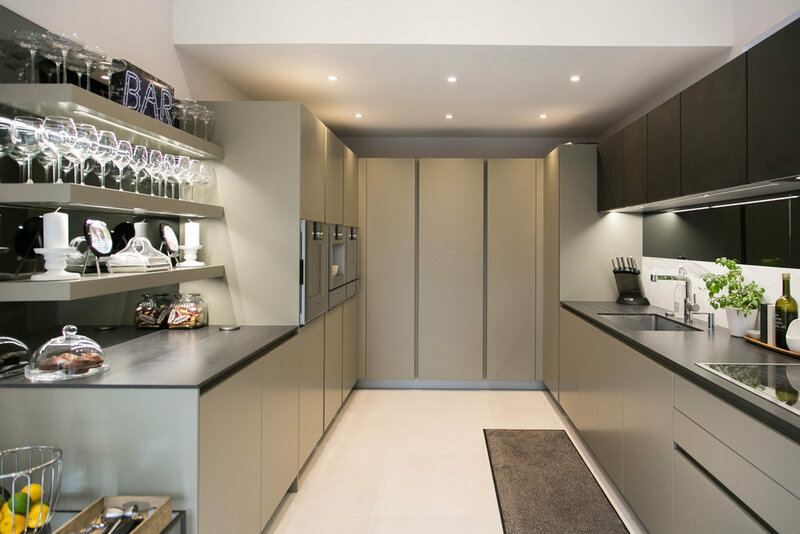 As part of a rear extension to a family house in Ealing, West London, this open plan handleless galley kitchen was designed by Sharan Johal using furniture by German brand, Leicht. The cabinetry and door and drawer fronts are featured in silk matt lacquer finish in a Titanium grey colourway. 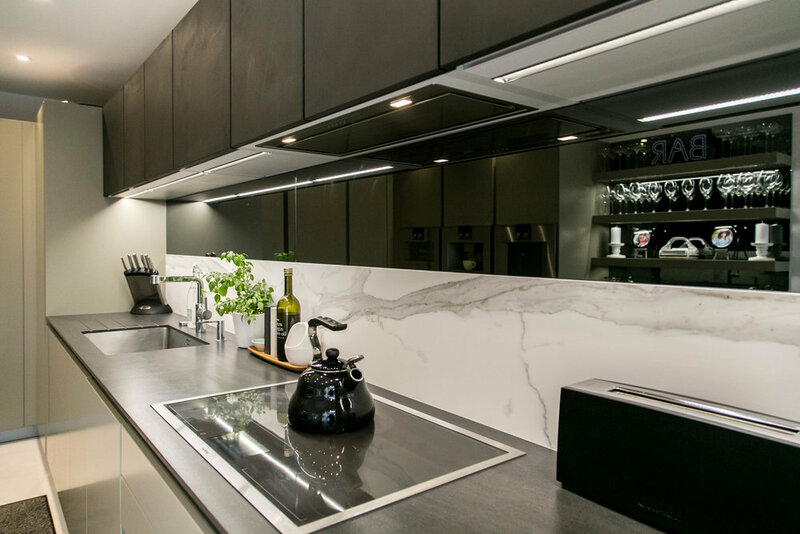 Overhead wall units are in a concrete lacquer finish in Brasilia colourway; a colour that complements the Neolith satin-finished porcelain worktop with bevelled edge in Basalt Black. 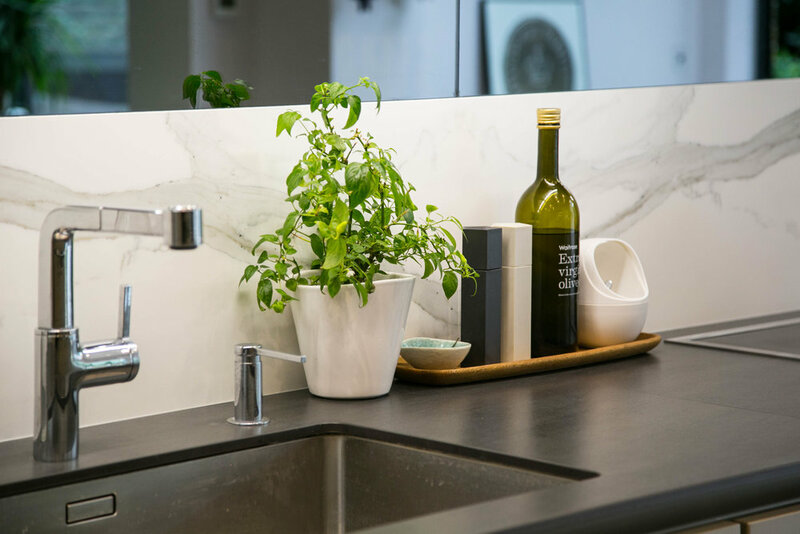 Facing the worktop and preparation area with Blanco sink, one wall features a grey mirror glass wall panel with matching backlit grey shelving, making of feature of the owner’s collection of glassware both day and night. Cooking appliances are by Gaggenau and feature a bank of appliances installed side-by-side within cabinetry at waist-level, which are complemented by a Gaggenau 80cm induction hob. Cooling and dishwashing appliances are by Miele and integrated extraction is by Falmec.